Do you ever use the Tarot to study your Shadow-side? My immediate thought was to do this reading with Robert M. Place‘s Vampire Tarot but I received the The Tarot of Vampyres by Ian Daniels the other day and am quickly falling for it. 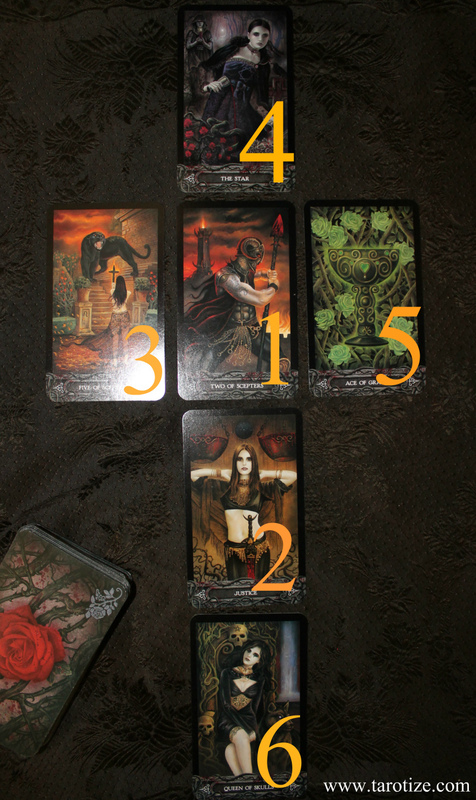 The artwork in this deck really draws you in and I felt it was a better choice for a fantasy style reading. 1. What would I be like? 2 of Scepters. I would be a warrior. Strong, passionate, impulsive but focused on the kill. Tattoos would feature quite heavily. Possibly a new tat after each significant kill. By that I mean kills that aren’t just for feeding. I would be waging a war on what I perceive as human filth. Politician’s heads would roll. Child abusers would live in fear from the very first day of my life as a vampyre. I would not accept another vampyre’s authority over me as I wasn’t born to follow. I scoff at the ancient hierarchy of the world of vampyres. 2. What aspect of my human personality or makeup would be magnified? Justice. My sense of absolute right and wrong would be incredibly acute. Knowing full well that I am a creature of shadow, I would see it as my duty to make the best of a bad situation. I would see killing as a way of balancing the scales. 3. What would I struggle with or fear the most? 5 of Scepters. The woman holding up the cross is a Warrior of Light. She is my lighter mirror image yet she seeks to thwart me. I fear her because deep down I know that the light will win in the end. 4. What would I strive to live for or accomplish? What would motivate me to keep going? The Star. Looking up at the stars at night – those distant suns that shine for me without burning my flesh – would make me feel apart of the all, condemned as I am to roam only at night. 5. What would I excel at or embrace? The Ace of Grails. I would see the blood of my victims as a sacrament. I would drink deep, with a sense of gratitude and communion. 6. What part of my humanity would I try to cling to? Queen of Pentacles. I would have a weak spot for animals and would keep a black cat and a raven for company. I would remember being a mother and would weep blood with pain at the thought of not being able to care for them any longer. I would not kill children and would try to prevent other vampyres from doing so.